We were on a roll with our beads and pipecleaners the other day when we made our beaded bubble wands, so we just kept stringing beads to make these garden ornaments. This is a project that has been in the back of my mind for a few years now, ever since I saw similar beaded garden ornaments for sale through the Gardener’s Supply Company catalog (although they don’t seem to be available anymore). We made the garden ornaments much the way we started out with the bubble wands—with a pipecleaner twisted around one end of a wooden dowel. As we filled the pipecleaner lengths with beads, we just twisted on another pipecleaner and kept going. Once we had five or six beaded pipecleaners on the end of a dowel, I used a little hot glue from the glue gun to ensure that they stayed in place. Maia made one, I made one, and Daphne filled two and a half pipecleaners with beads before moving on. Pretty good for a toddler. I used wire to wrap the beaded ornament “handles” to garden poles (I used a bit of hot glue, too, but it was hard and useless by the time I made it to the backyard). If I had thought ahead about this aspect of the ornaments, I probably would have done it a little more elegantly. Perhaps stuck the dowel into the hollow center of the bamboo pole or added the beaded wires directly to the pole. Who knows? Maybe I would have done it the same way. 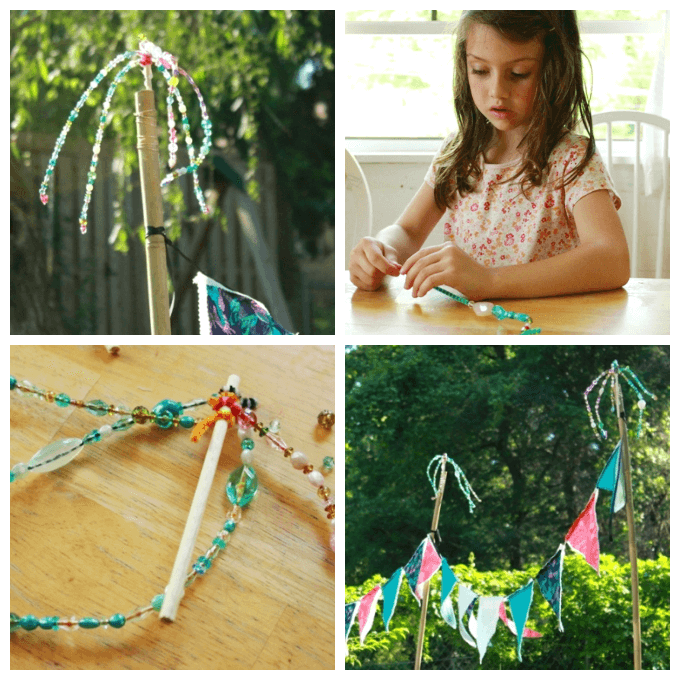 It worked pretty well as it was, especially as a kid craft project. These are the same poles that were holding up our garden wish flags, by the way. Now they are just a tad fancier. I especially love how the beads glow in the sunlight! We’ve planted Heavenly Blue morning glories at the base of each pole to twine up and add their beautiful blossoms to this part of the garden. In fact, I’ve planted vines in several places in the hopes of creating more vertical elements to the garden. And Maia has done her bit by planting sunflowers by the handful. I’m so curious to see what it will all look like in a couple of months! Another lovely bead craft! Fabulous idea to make some ornaments for the garden. They look much like colourful fountain! love this and the garden flags! I’m so doing this with my children for our fairy garden! I don’t think that this bead can be a garden ornaments. This was a creative and it is really looks good. Very pretty. Thanks for the great idea. This will tie in well with our nature unit at school! Jean- where do you find such a nice selection of beads- w/holes big enough for pipe cleaners? I have just found pony beads. Thanks! SO pretty. Lisa, I just bought our beads at AC Moore. The beads came in an assorted package and were on clearance for cheap. Like $1.60 or something. I think I just lucked out. You could look at the big craft stores, or fabric stores, and places like that. Our city has a bead store — I don’t know if you have anything like that near you. Good luck! Sounds like a fun tie in! Have fun with it! Maia is asking to make a fairy garden — something we haven’t done yet. Just made them with my daughter- beautiful! Did this today with my boys (yes, I said boys)! They loved it! Even my three year old completed one! Such fun & thanks for the idea! It made what could have been against, ugly day, quite lovely!